Designing a STEM lab can be overwhelming, but with a little direction you can design your ideal lab for teachers and students. Interior Concepts has over twenty years of experience designing furniture for technology labs and now we are helping schools with their STEM lab design. To get started download our free STEM Lab Planning Guide. According to STEMconnector.org, projections estimate the need for 8.65 million workers in STEM related jobs in the US by 2018. Plus it is expected that over 70 percent of jobs will require STEM skills. Once a leader in graduating students in the math and sciences, the United States Department of Education is actively promoting programs that will again boost interest in what are called STEM fields. STEM fields encompass four general areas of study — science, technology, engineering, and mathematics — of which available and projected jobs are rapidly outpacing qualified employees. STEM supporters recognize how interdisciplinary these subjects are, and rather than teaching these classes individually, the STEM disciplines are integrated and paired with real-world applications so students grasp connections between everyday life, school, work, and the global economy. This innovative and blended educational approach is not only influencing K–12 math and science curriculums, but also how classroom furniture needs to adapt for maximized learning. Promoting the key concepts of STEM through specialized curriculum often requires new spaces or repurposing and redesigning existing spaces. To help the people involved in designing these spaces, Interior Concepts has created a helpful planning tool. To start designing your STEM Lab download our free STEM Lab Planning Guide, or if you are ready to start a no obligation quote give us a call at 800-678-5550. 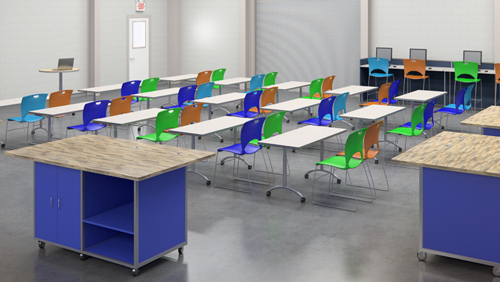 Drawing from decades of experience in designing and manufacturing high quality, made in the USA school furniture, Interior Concepts is your #1 choice for STEM and technology education furniture.